Breakfast pizzas are becoming an increasingly popular way to start the day. Chef Bill Briwa of the Culinary Institute of America showcases a hearty version topped with boursin cheese, scrambled eggs and sausage. There’s even a serving of veggies in the form of arugula salad with homemade potato croutons. 1. Prepare favorite pizza dough recipe. Roll out into circles and grill; set aside. 2. For potato croutons: Cook potatoes in boiling salted water until tender; drain. Tap each potato with a mallet or bottom of small saucepan until the potato cracks. Tear each potato into 1/2- to 3/4-inch chunks with craggy irregular shape. Set aside to cool and steam dry. 3. In medium saucepot, heat oil to 375 F. Fry potato pieces in batches in hot oil until deep golden brown and crispy, about 3 minutes. Drain potatoes on absorbent paper towels and season with salt and pepper. Set aside. 4. Spread grilled pizzas lightly with boursin. Place pizza in oven to melt cheese. 5. Saute sliced turkey sausage until browned and crispy. Add beaten eggs and scramble. 6. 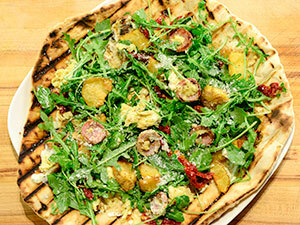 In large bowl, mix arugula, sun-dried tomatoes, torn potato croutons, olive oil, vinegar, salt and pepper. 7. Top pizza with scrambled eggs and turkey sausage mixture. Add arugula salad and dust with grated Parmesan cheese.